For Clark’s writing and its impeccably rendered Gothic atmosphere the book easily deserves four stars, perhaps even garnering five. This is the second book in a row I’ve read that focuses on the sea, the last beside it, and this largely on it, recounting the last surviving members of a once thriving dynasty of New England whalers and one teenage girl’s discovery of that family history. 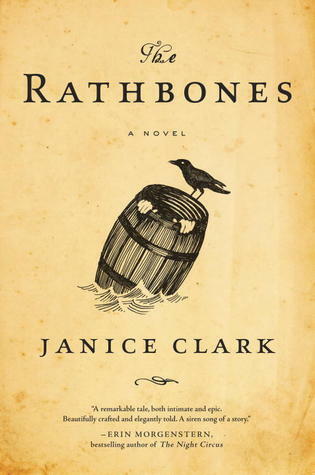 Descriptions of the ocean, the life within it and around it, and the workings of sailing vessels are beautifully conveyed, allowing Clark to truly immerse the reader into this bizarre world of the Rathbone clan. It surely is a bizarre world. Clark’s rich descriptions of settings and action are rooted in a mixture of Gothic mystique and mythological otherness. Magic fills the pages and envelopes the characters, sometimes merely imagined, sometimes quite real, and sometimes, well the reader can’t be too certain. Everything appears somewhat off-kilter in the novel, where you realize you are reading about a realistic time period, a realistic occupation, yet still filled with that otherworldliness of fable, of fairy tales. Things aren’t necessarily as they first appear, and only with the full revelation of the Rathbone past to the protagonist does the reader also fully grasp some answers behind the many mysteries. I would expect these aspects to lead me to adore this book. Gothic, dark, mysterious, magical, top-shelf writing… this should have been an adult high-brow dose of John Bellairs. Edward Gorey could have done the little illustrations. This should have blown me away. Yet, it didn’t. The weaknesses of the novel and the source of my disappointment came from the fact that it is simply dry. Lovely writing is admirable, and in a short story it can pack a punch, but to maintain that intensity over a novel and still keep things moving, still engage the reader in the story – not just the skill of the writing – that takes a lot. There is no humor here, no let up in the seriousness, in the Gothic bleak monotones. Poetic descriptions that dazzle give way to rapid actions that advance the plot amidst shadows of uncertainty. One rereads a passage wondering, ‘wait, did what I think just happen really happen, or did I miss something?’ The mysteries are so grandiose and murky, and the answers are given (at first) so subtly, that one has to pay strict attention, let a small detail fly by. With little let up, this can be exhausting. This on its own isn’t that big of an issue for me, but it does go hand-in-hand with the weakness I found most hard to move past…the characters are all so lifeless. You do get some thoughts of the protagonist, a good idea of what drives her, and yet many of her actions are just inexplicable, as mysterious as her family’s past. By rendering everything with this atmosphere of magic and mystery, Clark takes away a great deal of humanity in her characters. Some behave like characters from myth, some are not remotely as they appear at first, but for most all of them you never get much sense of their thoughts and motivations. Even as the protagonist learns about her Rathbone ancestors, their story is recounted in a dry historical fashion, learning where they start, where they end up, but little of who they really were. Large numbers of Rathbone offspring in each generation are cast into gender-specific groups with names such as “The Worn Wives” giving them some simple characteristic all in common, but no individuality, no humanity. To be fair, this characterization makes sense to fit within the mythological or fablistic foundations of the novel. But, unfortunately it also seriously detracts from enjoyment of the story, the plot, and from the reader’s desire to empathize with the characters. Finding a balance between their otherworldliness and their realism is difficult to achieve, and for some readers I’m not sure if Clark has done so here. I imagine that many readers will be blown away by the beautiful prose and atmosphere found in this novel, and others for whom that just won’t be enough to keep their interest. Or you’ll be like me and go for stretches in absolute love and awe with what you read interspersed with stretches of indifference.